Artefacts and records from the archaeological excavations of the burial crypt at Christ Church, Spitalfields are the scientific bedrock on which Gail is basing her exploratory research. The crypt was in use from 1729 to 1852 and contained almost 1,000 interments. Each excavated item, from coffin to face cloth, is identified by its excavation number detailing where, and with what, it was found. Over 350 of the interments can be identified by name, with Parish Records revealing tantalising clues to their occupations and relationships. 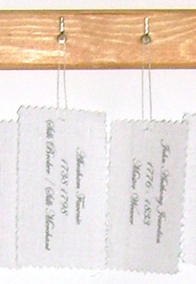 ‘The Named Sample’ examines the transition from simple codified identification, to the information required to construct an identity.